Seasonally, this works out to a springtime sort of salad here in California, when good citrus is still available and the summer squash are starting to come in too. The toasted nuts and salty cheese are irresistible, and the fresh produce is so juicy that no additional dressing is needed. Roast spears of zucchini drizzled with olive oil, salt and pepper at 400F until tender. 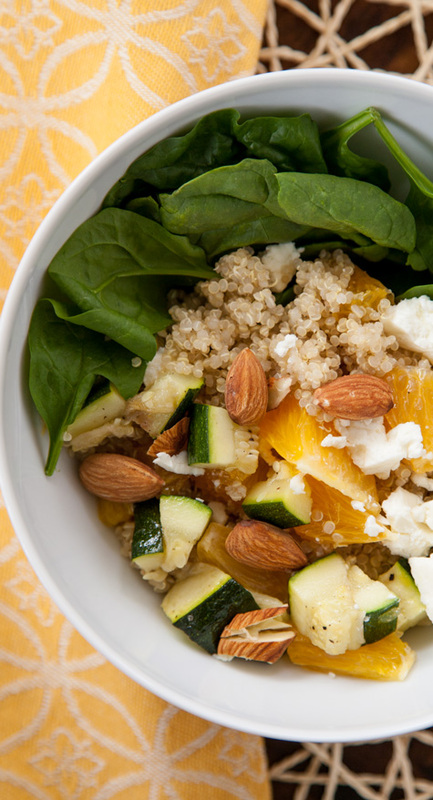 Then chop it into bite-sized pieces before tossing with quinoa, fresh orange slices, toasted almonds, feta cheese, and serving it all over a bed of fresh spinach. 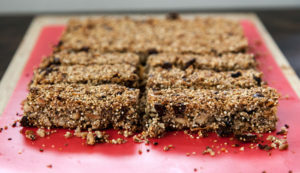 Fill up on fiber, phytonutrients and vitamin CRUNCH. Stir together a quick dressing from a splash of rice vinegar, a drop of sesame oil and a drizzle of honey. 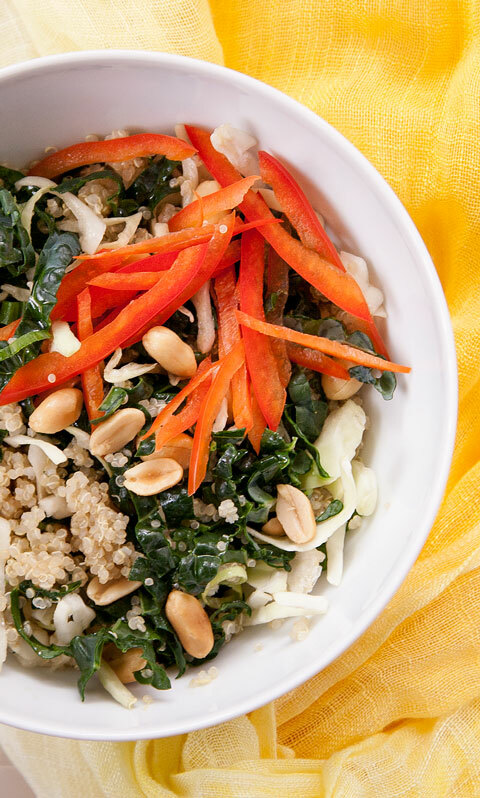 Toss it together with quinoa, julienned kale, shredded cabbage (optional), red bell pepper, scallions and salted peanuts. 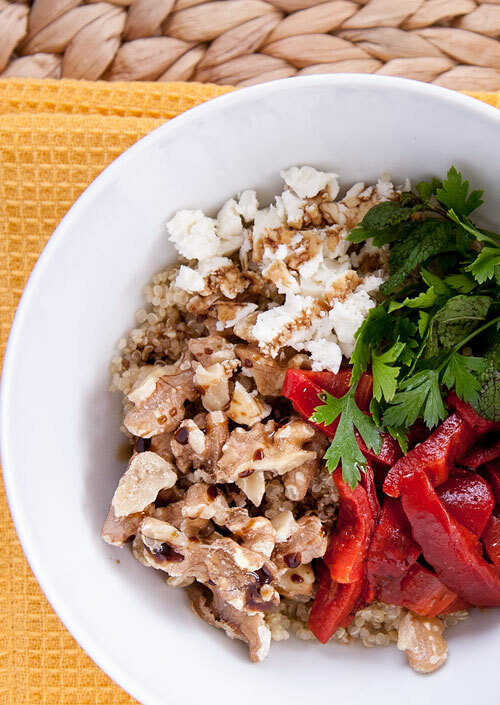 This salad is modeled after a deconstructed muhammara; like the exotic spread, it’s made from roasted red peppers, toasted walnuts and a drizzle of pomegranate molasses, but our version has nutrient-dense quinoa to stand in for the breadcrumbs! Don’t forget to punch it up with a sprinkle of feta cheese and all of your favorite fresh herbs too. And if you’re hungry for more than just salad, just wait until you try quinoa for BREAKFAST. 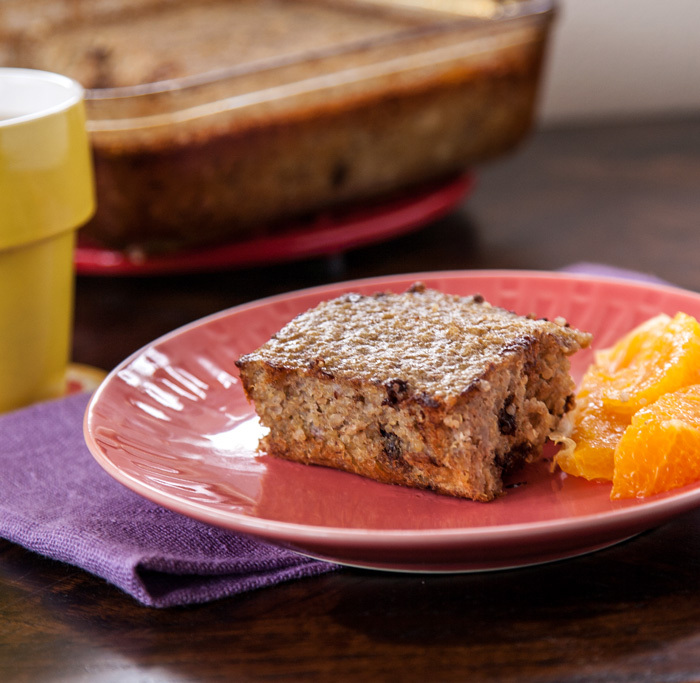 My partners in crime have you covered at Nutrition Milestones with two more nourishing recipes to start your day off right! I love this idea to do a deconstructed muhammara salad! 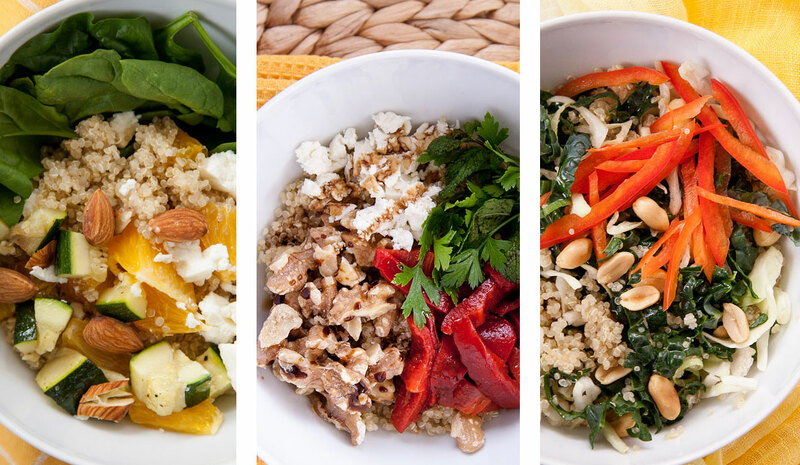 It’s fun to see everything that delicious sauce contains in a pretty bowl with quinoa. Thanks for the inspiration, Mary. Thanks Heather! It’s delicious, it went straight into my pack-for-lunch rotation.